Millennials have the unfortunate reputation for being job hoppers and job shoppers and that loyalty to them is just a Kendrick Lamar song. Despite this reputation, millennials, like anyone else, just want to work in an environment where they feel valued and appreciated. It's in a firm's long-term best interest to look for ways to keep the future of the firm happy and engaged. 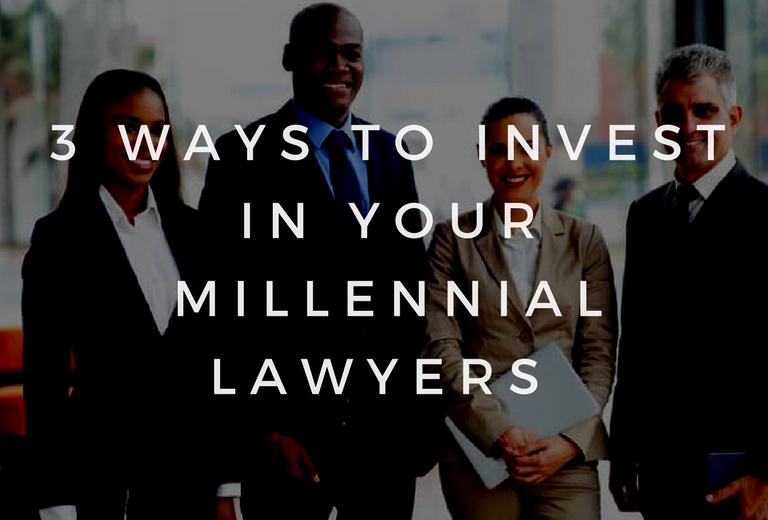 Here are three ways you can invest in your millennial lawyers that will make them want to stay and grow with your firm. Millennial lawyers are all about growth and want to stay where they are being fed and nurtured. Take a genuine interest in seeing them develop into the best attorneys they can be. Ask them about their career goals and help them chart a path to accomplish them. They're not looking for a boss, but for a mentor, someone to give them guidance and direction. Instead of keeping them chained to a desk and computer all day, allow them to get face time with the client and observe you in action. Furthermore, give them challenging and thought-provoking assignments and be there to offer support when needed. They don’t necessarily need a trophy, but they do want to be acknowledged for their work and accomplishments. A simple "thank you" or "good job" does wonders for morale. Once you see that they consistently do great work, make their salary or job title reflect it. Sticking to an arbitrary standard of waiting X amount of time to make partner, get a raise or receive an accolade is one of the quickest ways to make them feel that doing a good job for you is no longer in their best interest and will have them looking for the nearest exit. Millennials host a bevy of ideas and innovative ways of doing things. They genuinely want to feel like they’re a part of something and that their contributions matter. Instead of treating them as a nameless body only there to bill hours, seek their opinion on how to handle certain matters. More importantly, actually value and act on those opinions. It will make them feel like a rockstar and like they are an important part of the team. It will also go a long way to keeping them loyal and engaged. Like the old adage says, "it's cheaper to keep her." This also applies to the workplace. The more you prioritize employee retention, the less money you'll spend hiring replacements.